***Note if the online request form does not work, try using Mozilla Firefox or Google Chrome, as Internet Explorer does not always work! 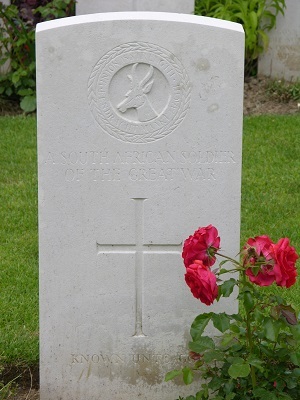 A South African Soldier of the Great War - Known Unto God. Buried in DELVILLE WOOD CEMETERY, LONGUEVAL, France. Most of the families and friends of South Africa's (and Rhodesia's) war dead will never get a chance to visit the graves of these fallen service people due to the distances and expenses involved with such a journey. Hopefully by archiving these photos we will be able to close a missing chapter in many people’s lives by supplying them a photo of the last resting place of a loved one. By archiving these photos will have created an online South African and Rhodesian national war cemetery. The future generations in turn will hopefully be able to learn from this archive, remember and never forget. ***NOTE*** - November 9, 2013 - we went live with our online database! Thousands and thousands of records have been updated. Have you searched for your relative yet? We constantly update hundreds of records a day to the online database. Watch this space for more details or visit us on Facebook! 24 June 2018 - Note we have been behind in updating the website homepage and spreadsheet list, the online database is updated daily. Our efforts are concentrated there. We are always looking to add new information, complete first names, dates of birth, family details and are always looking for photos. On average 50 records a day are updated. If you have any information or photos you can share it would be appreciated. 24 June 2018 - Israel page updated. November 28, 2017 - Nigeria page updated.